SNMP stands for Simple Network Management Protocol. It is used in network management systems to monitor network devices. It is part of Internet Protocol (IP) software suite. Using SNMP, one can monitor and control a network device. Moreover, one can receive notification from a network device. A SNMP-managed system consists of three components: SNMP agents, Managed Devices, and Network Management Systems. 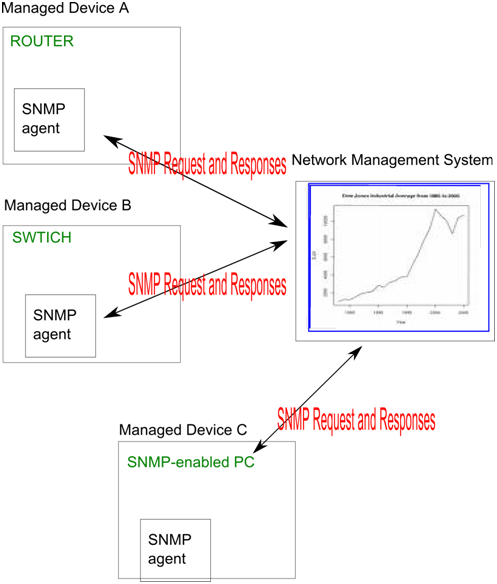 A SNMP agent is a software process that manages network information on a Managed Device. A Managed Device is also called a SNMP-enabled device; routers, switches, PC, lab tops, or even smart phones are all examples of Managed Devices. A Network Management System is a computer that polls from Managed Devices and organizes the data in either textual or visual form.